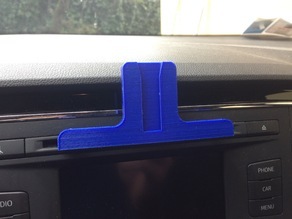 I saw a store-bought version in my buddies car and felt like there had to be someone who had designed a 3D print for this. Thanks a ton, I needed it! I keep breaking my phone mounts via vigorous arm flailing, so if/when I do that again I have an easy replacement method. I angled mine a smidge because I wanted a better view of the screen. All I did was raise the flat "back" of the plate file a little on one side to make a wedged angle, super simple. I also resized it for my LGG5 by finding out the dimensions of an iPhone 6, cross-checking it with the dimensions of the phone holder to find out the wall thickness, then adjusting accordingly to fit my phone. Seriously, great job on this one. Really helpful, thanks a ton. I hate waiting for prints, so I sped up the print speed in all areas for this one; didn't seem to affect it negatively at all.